Towards the end of last week I was invited down to the University of Warwick to meet with Amber Thomas, formerly of Jisc, and now the University’s Academic Technology service leader. Amber invited me down to talk about the university’s educational resource management infrastructure and it was a real pleasure to be able to see some of the technology approaches we explored for many years with Jisc starting to be put into practice in an institutional context. Jon spoke about the sea as the quintessential inaccessible wilderness, abstracted and distanced from our everyday reality. However geographers are demonstrating that the sea is not an empty trackless void and are starting to develop a fluid ontology. Jon made the point that we cannot abstract a representation of the world because we are slap bang in the middle of it and he called for the development of a “thalassology”, a new language for conceptualising water – human interactions. Jon ended his talk with his film Affective Surfscapes. Communicating Surf Convergence: Can only a surfer know the feeling? which quoted extensively from Jack London’s The Royal Sport and Drew Kampion’s The Lost Coast. Following the trauma of the tsunami, people in Arugam have had to renegotiate their relationship with the sea. There may be fear of the sea, but it is not feared because it is unknown, there is an in depth knowledge of its specificity. Negotiation of the tsunami has been mediated through knowledge of the sea. Emma Spence, University of Cardiff. Emma called for a more-than-sea relational approach to maritime geographies which takes into account the relationship of the shore to experiences of the sea. In her case study of super luxury yachts in the South of France, Emma referred to the gendered nature of crews’ experiences of the sea. Male deck crew have a very different experience of the sea, and particularly of sickness, from female cabin crew. Emma also discussed the excessive drinking culture that is embedded in crew culture and is fundamental to their relationship with the shore. All three papers sparked a fascinating discussion on the gendered nature of sea narratives and on the prevalence of metaphors of colonisation and conquest in relation to the sea in general and surf culture in particular. Will and Emma made specific reference to these gendered narratives in their presentations but to my mind this discourse was most striking in the almost hyper masculine narrative of Jon’s surf film. David Lambert also commented on the fact that Jon’s film opened with a clip of the 1999 Guinness “Surfer” advert, questioning whether surf imagery and narratives have been appropriated by multinational corporations with neo-liberal agendas. The afternoon panel, chaired by Tara Puri, focused on “Narrating the sea: traveling texts”. Michael focused on two early 17th century French travel narratives by apothecary Jean Mocquet (1617) and navigator Francois Pyrard de Laval (1619), who shared a ghost writer. 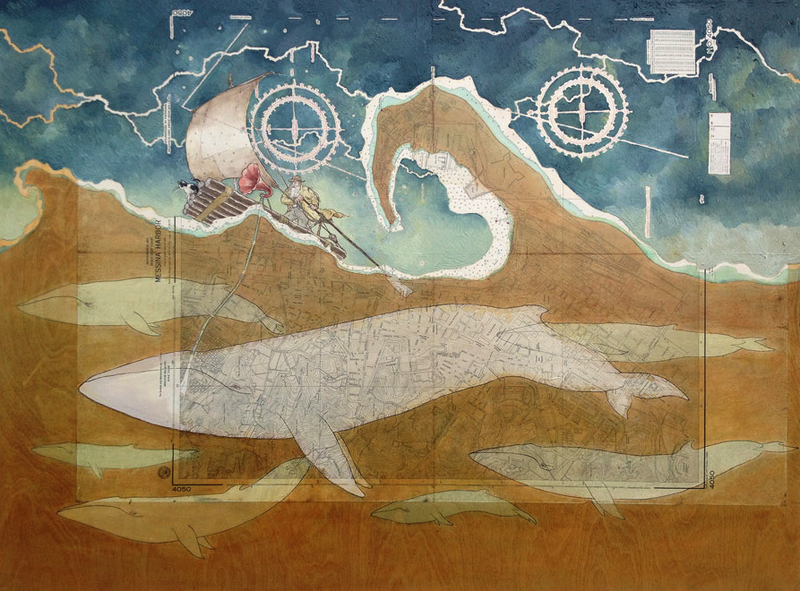 There is an authoritative specificity of time and place in these sea narratives. There is a singularity of trajectory in Pyrard’s narrative, events are accompanied by exact geographical and temporal markers. Mocquet, by contrast, invokes an infernal situation where authority is continually in question. Elodie’s research focuses on the translation of the experience of capture and captivity into narrative text. There was a large audience for captive narratives in the 19th century and some were fictionalised and rewritten for publication. The narratives of Napoleonic naval prisoners of war dramatically evoke the loss of their ships and their entry into captivity. There is no common narrative of captivity but tropes can be identified, including a sentimental separation from the sea. Prisoners mused on their capture at sea during the period of their captivity. What prompted these individuals to narrate and publish their experiences of captivity? Naval prisoners were prompted to write their lives through their professional practice (e.g. Admiralty reports and log books), as a form of personal justification, and to communicate with their families. Many captives introduced their texts with classical quotes to emphasise the epic nature of their experiences. Escape is legitimised by emphasising prior bravery at sea. The French prison depots were as far removed from the sea as possible and yet the naval space was reproduced here. Captives in the prison depots were “Jack Tars ashore”. The sea is missing form these spaces, yet at Verdun in particular the landscape is perceived through its watery nature. The locus of activity is shifted from the sea to the River Meuse and the French press continually reported on the English prisoners activities around the river. The experiences of liberated children are particularly problematic. Returning to a land which is unfamiliar and foreign to them is almost a second captivity. The experiences of Irish prisoners and their relationship to naval and British identity is also deeply ambiguous. Barbara began with John Masefield’s “Sea Fever” and focused on sea narratives in a number of Byatt’s texts including Morpho Eugenia, The Conjugal Angel, The Biographer’s Tale and Sea Story. Barbara presented an intertextual analysis that explored the the opposition of “imperial navigation to the boundless seas of literature” and the creative and disruptive powers of literature, writing and the sea. Charlotte Mathieson has blogged an excellent summary of the Symposium here and has also posted a storify of my tweets here. Full abstracts for the event can be found here.